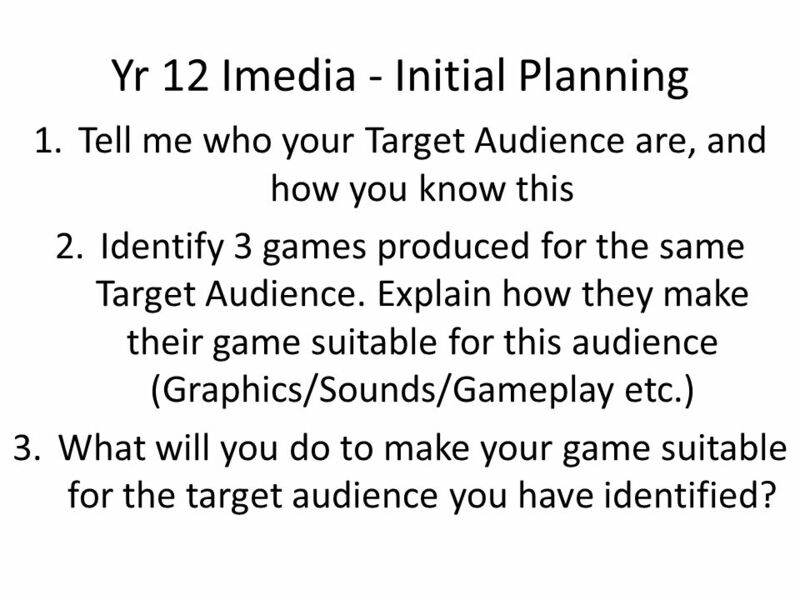 2 Yr 12 Imedia - Initial Planning 1.Tell me who your Target Audience are, and how you know this 2.Identify 3 games produced for the same Target Audience. Explain how they make their game suitable for this audience (Graphics/Sounds/Gameplay etc.) 3.What will you do to make your game suitable for the target audience you have identified? 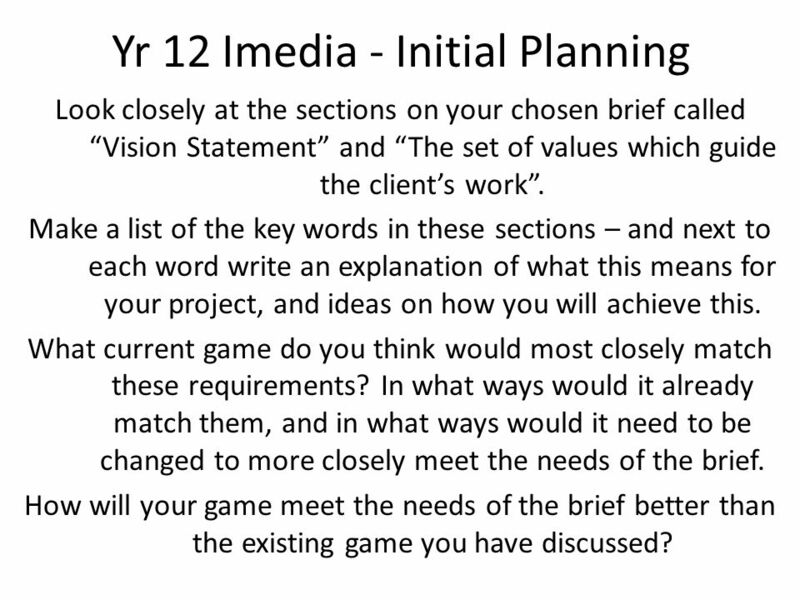 3 Yr 12 Imedia - Initial Planning Look closely at the sections on your chosen brief called Vision Statement and The set of values which guide the clients work. Make a list of the key words in these sections – and next to each word write an explanation of what this means for your project, and ideas on how you will achieve this. What current game do you think would most closely match these requirements? In what ways would it already match them, and in what ways would it need to be changed to more closely meet the needs of the brief. How will your game meet the needs of the brief better than the existing game you have discussed? 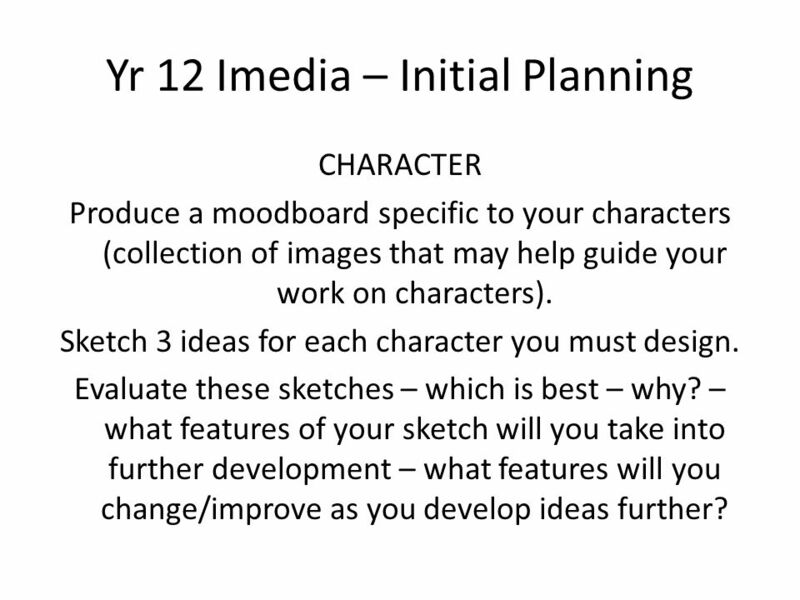 4 Yr 12 Imedia – Initial Planning CHARACTER Produce a moodboard specific to your characters (collection of images that may help guide your work on characters). 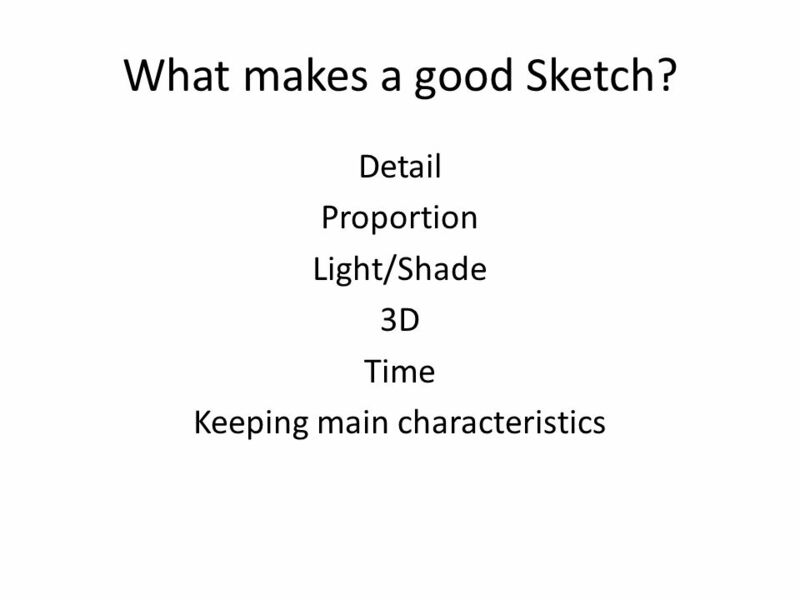 Sketch 3 ideas for each character you must design. 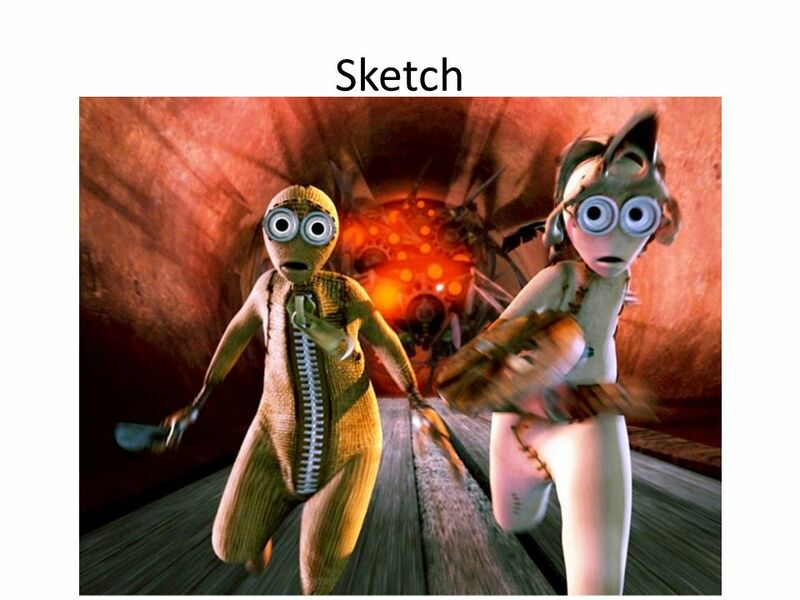 Evaluate these sketches – which is best – why? – what features of your sketch will you take into further development – what features will you change/improve as you develop ideas further? 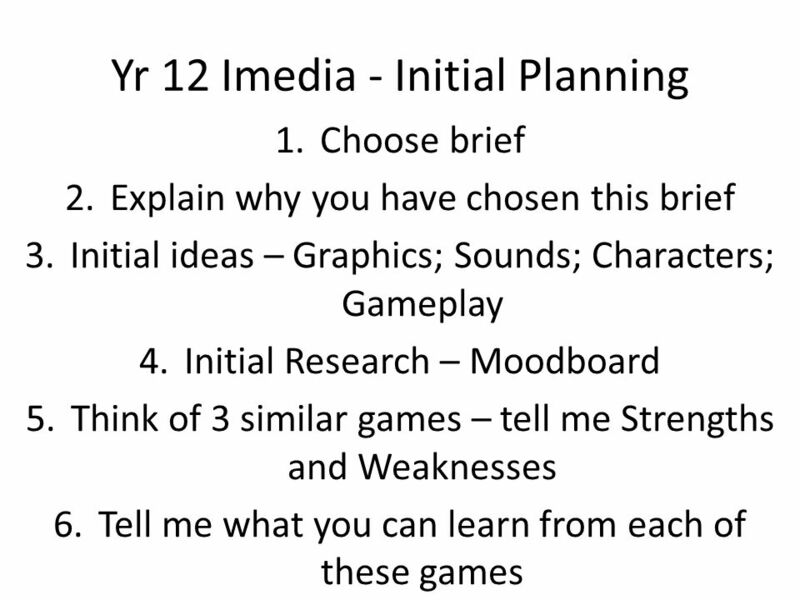 Download ppt "Yr 12 Imedia - Initial Planning 1.Choose brief 2.Explain why you have chosen this brief 3.Initial ideas – Graphics; Sounds; Characters; Gameplay 4.Initial." This represents 50% of your course mark at National 5 (60 marks) and will cover your added value unit for National 4. Opportunity to demonstrate your. CD Rack Exemplar Folio. The Front Cover should include:- Your Name, Project Title and leave room to add a picture of your solution later. Speaking to Inform 1. Types of Informative Speeches  Briefings and reports  Audience generally has good understanding  Lectures/seminars  Audience. Start with a front cover, add the Subject, Unit and your Name. Total Marks available for this folio 52 Pass score 31. The Quest for a Perfect World UTOPIA UNIT INTRODUCTION. The camera never lies… Or does it? By Meera Ali. The brief A local photographic company called Progress Media is holding a competition for students, to. Sketch Templates Product Design Sketching. Types of Template Outline Template Detailing Template Background Template Colour-matching Template Projection. 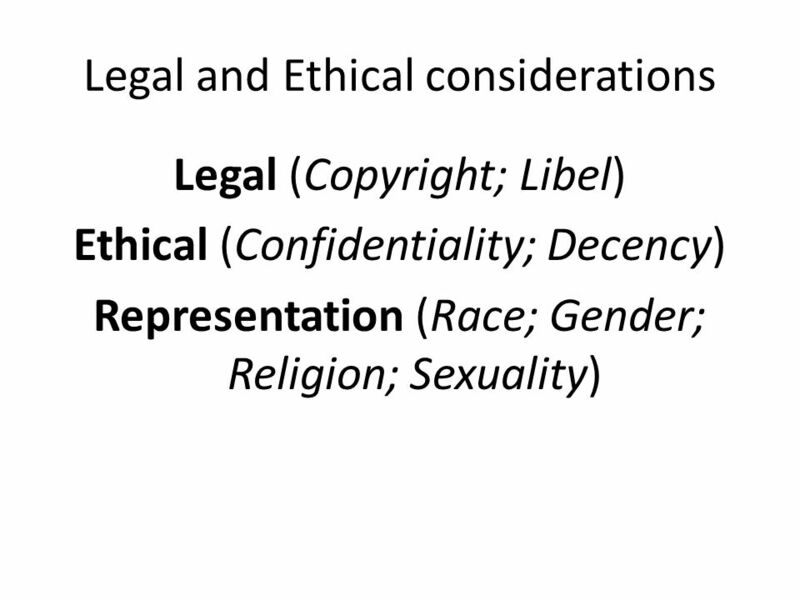 INVESTIGATION SECTION: (to be completed within 2 lessons) (This is what is required of you in a word document) Identify the Problem. 1. Examine the problem. Assessment for Learning in Art resource development and rationale pupil self assessment and record of achievement sheet. AS PRODUCT DESIGN Bridging Unit Pewter Casting Project. 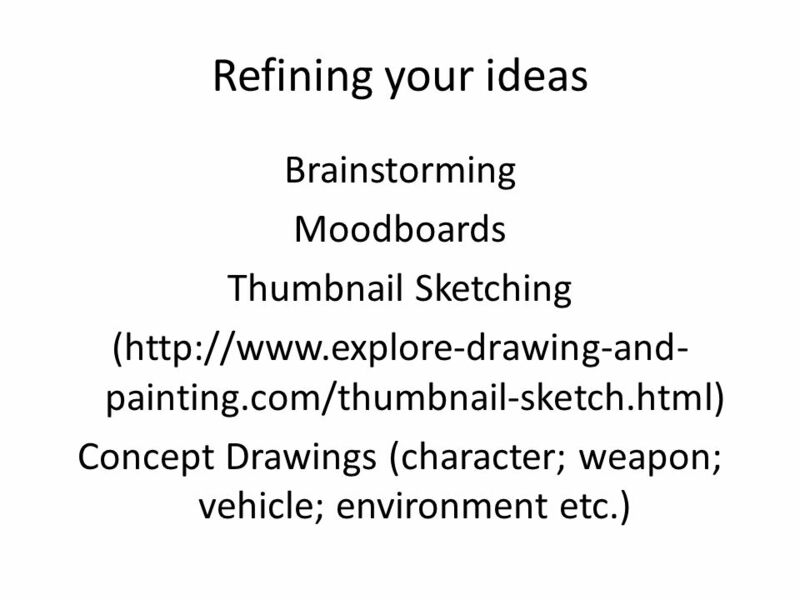 TASK 1 In this task, you will demonstrate your understanding of the purpose of concept art for video games. You are employed by War of Art Games. SELECT A LESSON 1. A WORLD AND CHARACTERS 2. PATHS AND ENEMIES 4. USING PAGES TO CHANGE THE RULES 5. GAME ANALYSIS AND DESIGN 6-7. CREATING YOUR OWN GAME. Problem Solving Unit 2. Problem Solving 1. Define the problem – What is the problem? 2. Generate possible solutions – What are some things I can do to. Graphic Design 1. What is Graphic Design? Any form of visual artistic representation. Visual communication intended to be used with commercial printing/reproductive. Media Studies Lesson 4 Monday 1 st September 2014.